How Will Trump Handle Transportation? Elaine Chao will be key. Federal infrastructure dollars might help fund state’s local roads. Elaine Chao. Photo from the U.S. federal government. Photo is in the Public Domain. When the new administration takes over in Washington there will be a new Transportation Secretary. That will be Elaine Chao. 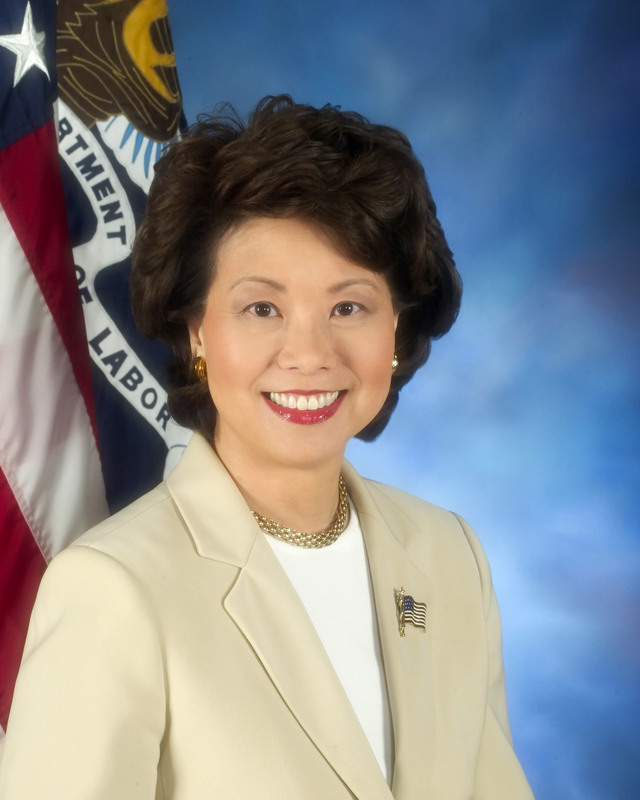 Chao is a Washington veteran having served in high-level positions in previous Republican administrations. And unlike many of the new president’s appointments her confirmation hearing was uneventful and she enjoys wide bipartisan support. Chao promised senators a more detailed plan within 30 days on how the administration would make good on a campaign pledge to invest $1 trillion to rebuild America’s aging infrastructure. And it was notable that she admitted that at least some of that would be taxpayer dollars. That’s important because some Republicans had talked about a vague idea to fund these public investments solely through private sources. That would almost certainly drive up the price as large profits would no doubt be rolled into the projects and it would run the risk of turning over some public rights of way to private, for profit entities. Taxpayers and all road users have reason to be skeptical about that idea. In addition, private businesses would likely only be interested in building and operating high profit, high volume thoroughfares like interstate highways. Rural Republicans and Democrats have rightly raised concerns about that since small roads are not likely to attract private investment. So, while we don’t know what Chao thinks about cycling, she strikes us as a grounded, reasonable and intelligent person and, in this environment, that’s about the most anyone can hope for. Also making news this week was Wisconsin Assembly Speaker Robin Vos (R-Burlington) who all but conceded that a gas tax or registration fee increase will not happen in the next state budget. Vos has been supportive of a transportation tax increase (the gas tax hasn’t been raised since 2006), but Governor Scott Walker has been firm in his opposition unless corresponding tax cuts can be found. On Wednesday Vos admitted that he wasn’t going to be able to budge the governor on his position and it seems unlikely that hundreds of millions of dollars in tax cuts can be found to offset a gas tax or registration fee increase. Still, the governor has proposed significant funding increases for local roads – where, after all, most cycling takes places. So, while we’re not certain that a no transportation tax increase position is good public policy in the long run, if the next budget delivers more dollars to local roads that’s a good thing for people who ride bikes. But this also brings us back to the federal budget and Secretary Chao. Vos also said that the legislature may come back in the fall to adjust the state budget after the new federal budget is passed. (The state budget usually passes by around July 1st while the federal fiscal year starts a few months later.) And it’s possible that that new federal budget will contain substantial infrastructure investments that could change the equations yet again. All of which is to say that this is a time of considerable interest in transportation funding at both the federal and state level and the Bike Fed will be in the mix, trying to make sure that there are resources there to make cycling and walking safer and more enjoyable. Whatever happened to all the drugs that were found on the shipping container boat her family owned? I guess if you fund enough high paid politicians you can get away with anything. That story got completely swept under the rug. With the present fiscal situation in state and national, the chances of lots of money being spent for cycling is impossible. Want more cycling programs, come up with way of paying for them. I believe there is virtually no chance that a “Trump budget” will include any significant additional funding for local roads, not to mention bike trails. In fact it looks like OMB under Mulvaney is working off recent GOP blueprints, that would reduce federal road funding to states and eliminate the Transportation Alternatives (TAP) program, which funds bike trails. I can’t envision Ryan generating a deficit for stimulus. Sorry Dave, ideologues are in control. Mark, if you want bike trails. Pay for it and stop being a cheap skate. If you want better access bike lanes through Milwaukee and the rest of Wisconsin pay for it. Would you rather we slap a $100 tax on all new bikes, and $50 on used bikes or an annual registration fee for teenagers and adults? To read more about Chao, as well as other (very, very rich) Trump appointees (i.e. hardly what anyone would call normal,down-to-earth folks), see: http://nymag.com/daily/intelligencer/2017/01/billionaires-millionaires-trump-cabinet.html. Jason what’s your philosophy when it comes to transportation funding? Since most people today still prefer to drive a car, should most funds and resources and efforts focus on freeways and highways, with a small amount devoted to public transportation? Or not that severe of a disparity? How much focus should there be on the future and anticipating transit trends 5, 15, or 20 years from now? Are bike paths important for cities or just something used by rich people who have expensive bikes? You don’t seem very supportive of any transportation that doesn’t involve automobiles but I don’t want to put words in your mouth so maybe you can explain your outlook. Jason–I am not advocating for bike trails, or for them to be included in a federal transportation bill.If you read my comment, the primary “object” was local roads. My point is that a Ryan budget won’t include a meaningful stimulus of any kind, as he is reserving deficit space for the major tax cuts for the upper portion of the income scale. Mark, about a dozen times since the election surprise President Trump and his Treasury Secretary Mnuchin have stated that the income based wealthy will not get a real tax cut after deductions are eliminated in 2017. I suppose Congress has a seat at the table but why assume a huge tax cut for the job creators. Jason you continually act like Trump doesn’t lie. What’s the basis for your trust in him? Big fan of alternative facts are ya? Vince, we can both agree that the Wall Street crowd has gotten fat under both Bill Clinton and Barack H. Obama. If you had owned the SP 500 under both administration you did very well. Trump will face a more challenging road. He will not fare as well as our Wall street presidents. He must find results as companies like Amazon with their high tech efficiency swallow all American jobs in various sectors and with out small businesses owned by Hispanics and rural Wisconsin he is toast in 2020. But not under 8 years of George W. Bush? The Wall Street crowd was on welfare while he was president? Dude, our aging infrastructure is no joke, we need to fix a ton of things before it collapses (plus it adds a lot of construction jobs & employs civil engineers, which aren’t outsourced). Hopefully there will be more bike lanes in college areas in the future!